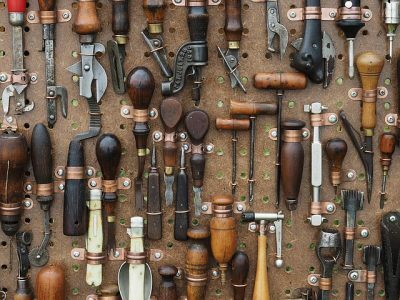 This article is all about storing your power tools in the correct manner. In it, we will go in detail about all the intricacies regarding the matter. After you’ve read it, and carefully analyzed it, all that is left is to utilize our methods. Before you know it, your power tools will be well organized, clean, safe and of use to you for many years to come. So, without further ado, let’s get to it. 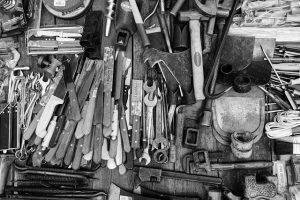 If you are anything like the common folk, you are storing your power tools in the basement, in a workshop or in the garage. However, the room in which you keep them has little effect on their longevity and overall safety. As long as you don’t keep your power tools in the bathroom or sauna, you’re good. 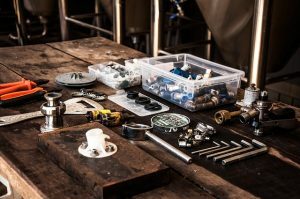 Since our common goal is to keep your tools from rusting, you probably understand why damp places are not the best choice. Surely there must be a better way of storing your power tools that this! Cheap and easy. An option that won’t take too much of your time, nor your finances. Simply hang pegboards on the walls of your room of choice and store your tools on it. This is a great way to keep them off the floor and easy to reach. Your smaller tools and accessories, use your drawers as a storage system. It is a great way to protect these objects from dust. For those lacking space, a storage rack will do wonders. If your room has walls, you have all the space you need for this solution. It will keep your power tools on display and neatly organized. With this method, you can forget about wasting precious time looking for the tool you need. Pricey, yet worth the while. If you are looking for a foolproof option for storing your power tools and don’t mind spending a few extra bucks on it, this is it. Power tool storage cabinet. The way to go about organizing it follows. Now, this is not the way your power tool storage cabinet should look like and you know it. This is an essential step that will keep your tools by your side for the years to come. Not to mention that it also keeps them tidy. In order to make the tool in question grease, debris, and dirt-free, it’s best that you start by using a rag or a towel. And, since some can be clean with plain water, while others require certain chemicals, it’s best that you check their label for a recommended cleaning method. Be mindful of the warnings as well, and avoid mixing chemicals without previously consulting the experts on the matter. As for the metal surfaces, they might need special attention. If you want to clean them properly, you will need to extend your efforts to find an approved solution. With it, you are to simply scrape away any soil or dirt on the metal area. It is of supreme importance that you dry the tools completely. Use a rag or a towel to do so. After you are absolutely sure that the item is dry, feel free to put it on its designated area. The time you spend on cleaning your power tools can also be used for checking for damages or defects. Any kind of impairment means that you need to take action. Either fix it, or find someone who can, or throw the tool away. The logic behind this is rather simple. If the tool is damaged, you either cannot use it or are exposing yourself to hazard. So, a tool that you cannot use should simply have no room in your storage cabinet. Instead of cluttering up the needed space, use it for an item that works properly. 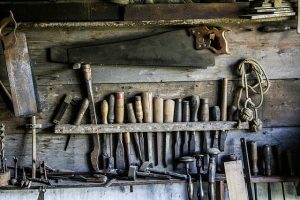 If your tools start to look like this, you’re on to something. This advice should be your bread and butter when storing your power tools. Doing so will save both you and your power tools from harm. In case of flooding, your tools can be damaged beyond the point of repair. In addition, keeping them on the ground exposes them to a risk of items falling on them. And, surely, you want to avoid tripping on the items that are laying on your floor. So, keep your tools off the ground. Either put them on shelves or use boxes. Use moving boxes Ontario if you have some in store from your relocation. Plastic bins can also be a great option. Any kind of see-through storage solution will shorten the time of your search for any specific tool. Make sure to label the boxes for better organization. Next Band practices in storage units – is it possible?